Dr Bashah is the Director of the Metabolic and Bariatric Surgery Department at Hamad Medical Corporation in Qatar. He completed his fellowship in metabolic and bariatric surgery in 2013 (ACGME accredited) and has been a Fellow of the European Board of General Surgery (FEBS) (EBSQ), Helsinki, since 2013. He has been a Fellow of the Egyptian Board of General Surgery (FEB-GS) since 2006. 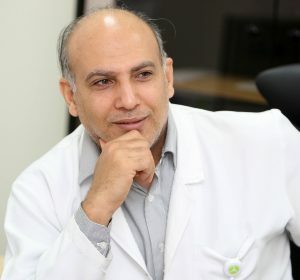 Dr. Bashah completed his PhD in General Surgery at the Supreme Council of Universities, Egypt, in June 2005 and became a member of the Royal College of Surgeons of Ireland in ‏2004. He has also been a member of the Royal College of Physicians and Surgeon of Glasgow since 2005. He received his Diploma of Laparoscopic Surgery from the University of Strasbourg, France, in 2006 and his Masters degree in General Surgery from the Faculty of Medicine at Ain Shams University, Egypt, in 1997. He completed his Bachelor of Medicine and Bachelor of Surgery at Tanta University in 1991. Dr. Bashah ia a Fellow of American College of Surgeons (FACS) as well as a Fellow of the American Society of Metabolic and Bariatric Surgery (FASMBS), member of the ASMBS international committee, a board member of the Gulf Obesity Surgery Society (GOSS) and a member of the Pan Arab Obesity Society of Metabolic and Bariatric Surgery (PASMBS). Dr Bashah. is a reviewer in many international peer review journals .